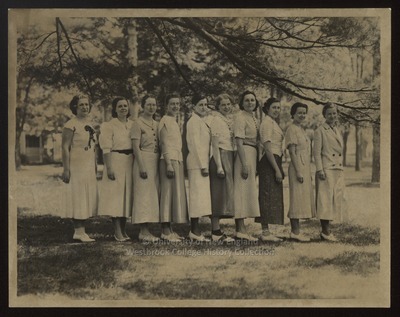 "Senior Class, Westbrook Junior College, 1934"
Photographed on the Green, the ten members of the Westbrook Junior College, Portland, Maine, Class of 1934 are, from left to right: Ruth Deidel, Barbara Lyon, Esther Wellcome, Elizabeth Freece, Barbara Somers, Louise Thorndike, Edythe Hermes, Mary Pride, Eleanor Stevens, and Madeleine Blom. Dressed in spring suits, skirts & blouses, and dresses, the young ladies face left with right shoulders and smiling faces toward the camera. All wear white shoes; most wear nylon stockings; and several wear bobby socks.